An impressive achievement in implementation of the national plan to reinforce engineering and high-tech professions: From the 2017/18 data, we see that for the first time, engineering studies have achieved the highest enrollment in Israel in bachelor’s degree programs (34,660 students constituting approximately 18.3% of all bachelor’s degree students). 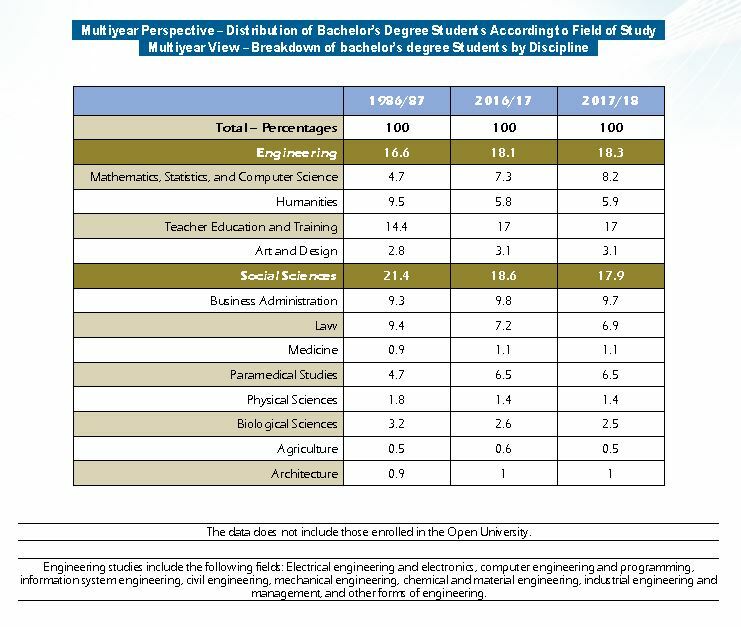 Engineering studies have thus surpassed social sciences (34,030 students constituting 17.9% of all bachelor’s degree students) which, throughout the years, were considered the most popular courses of study in Israel. An increase of approximately 50% was also noted in the study of mathematics and computer science, 15,553 students in the 2017/18 academic year as compared to 10,434 students in the 2011/12 academic year. Thus, one out of every four students in Israel in the past year studied engineering or computer science (50,214 students out of a total of 189,845 bachelor’s degree students). In the framework of the multiyear high-tech reinforcement plan and in light of the government’s decision on the matter, the PBC allocated incentives of hundreds of millions of shekels to academic institutions in order to absorb students, hire academic staff, and build and upgrade research and teaching infrastructures. Data shows that there is a sharp decrease in courses of study such as law and business administration which were very popular at the start of the decade. According to data, the study of law has decreased from 16,446 students in 2011/12 to 13,168 students in 2017/18. Business administration studies has decreased from 22,654 students in 2011/12 to 18,401 students in 2017/18.